Chip Off Whomp's Block is the first mission of Whomp's Fortress in Super Mario 64 and its remake, Super Mario 64 DS. The mission's goal is to reach the top and fight the fortress's boss, the Whomp King. The level name is a pun on the expression "a chip off the old block," which refers to someone closely resembling their parents. 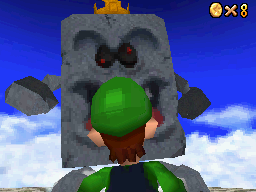 The Whomp King in Super Mario 64. At the start of the mission, the "Lakitu Bros." explain (purportedly as a news report) that walking slowly lets the player sneak past enemies. This comes into play during the mission, as there are several sleeping Piranha Plants that wake up if the player is moving too quickly. While climbing to the top, the player has to avoid Moving Bars extending in and out of the wall on the main path, as well as Thwomps and Whomps blocking the path. Once the player reaches the top and confronts the Whomp King, the king complains to them about how the Whomps act as construction workers, building houses and paving roads, without ever being thanked, much to his frustration. He decides that he cannot let anyone else walk over them and attacks them. The Whomp King attacks by slamming his body onto the ground in an attempt to crush the player. To defeat the Whomp King, the player has to wait for him to attack, which leaves his back exposed, and Ground Pound him. The Whomp King then gets back up and the cycle repeats. This must be done three times to defeat him. After the third hit, the Whomp King expresses his frustration once more, but gives the player his Power Star without any more complaints and promptly explodes. Wummps! (DS) Defeat King Whomp! "Return of the Whomp King", from Super Mario Galaxy 2's Throwback Galaxy, is a remake of this mission. This page was last edited on November 25, 2018, at 08:57.